• It was also interesting to hear Delgado, who eventually made close to $150 million during his 17-year big league career, reflect upon how financially strapped he was as a teenager with the class-A Short-Season St. Catharines Blue Jays in 1989 and 1990. “I remember the first year there we rented bikes. We didn’t make enough money to have a car. So we lived in town and we rode our bikes to the stadium,” he said. The cost of renting a bike the first year he was in St. Catharines was $25 a month, but the second year the person he was renting the bike from upped the price to $50 a month. “That was a big price hike when you were making $800 a month,” he said. • There was nary a dry eye under the tent during the ceremony when Jim Fanning’s son Frank Fanning beautifully eulogized his father who passed away from a heart attack on April 25 at the age of 87. Frank spoke poignantly about his father’s accomplishments with the Montreal Expos, his love for coaching kids and his long friendship with 2015 inductee Felipe Alou. Fanning was supposed to introduce Alou at the ceremony. Frank told the crowd that speaking with Alou on Friday had been the closest he had felt to his father since his dad’s death. At the end of his eulogy, Frank put on his Expos cap and asked the crowd to think of his father when they wore their Expos caps. • During his eulogy, Frank Fanning also revealed that his father was offered the New York Yankees manager’s job in 1982 and later the Minnesota Twins general manager’s position in 1985. He turned down both offers to remain with the Expos. • Inductee Corey Koskie, who had his big league career cut short by a concussion, confirmed at the press conference on Saturday that he had been in recent contact with his former Twins teammate Justin Morneau (New Westminster, B.C. ), who’s sidelined again by concussion issues. Morneau, now with the Colorado Rockies, has battled concussion-related issues since colliding with Blue Jays shortstop John McDonald while attempting to break up a double play on July 7, 2010. He experienced the concussion symptoms again after making a diving play in a game against the Los Angeles Angels on May 13 and he has not played since. • This week’s trivia question: After the Toronto Blue Jays signed Carlos Delgado as a 16-year-old catcher, he was assigned to the class-A Short Season St. Catharines Blue Jays in 1989. There he would serve in a back-up role to a Canadian catcher. 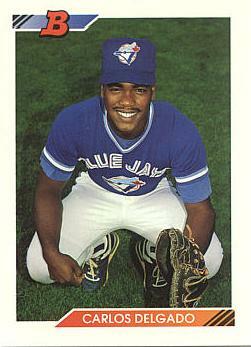 Who was the Canadian catcher for the St. Catharines Blue Jays that season? Please provide your answer in the “Comments” section below. The first person to provide the correct answer will win a set of 2015 Canadian Baseball Hall of Fame inductee cards (five cards). Thanks for the kind words, Devon.. It was a great day! Greg O’Halloran. I cheated, as I was at the HOF and Carlos mentioned Greg in his speech. A great day! Nice job, John. You are right, but Paul got the answer before you. Great to see you yesterday. Great job at the podium. Thanks also for supporting the blog. Thanks, Brent. It was great to meet you yesterday.